The federal judge who has held three presidential administrations accountable for the protection of wild salmon on the Columbia River is stepping down from the case. In August he gave the federal government until 2014 to modify its latest plans. U.S. District Judge James Redden has been a good and demanding steward of the Endangered Species Act and the protection of Columbia River wild salmon. He pointedly let three presidential administrations know they had not met the intent of the law and he would not accept half measures. The announcement by the 82-year-old federal judge that he will relinquish the case came about four months after he had knocked down another plan from the Fisheries Service of the National Oceanic and Atmospheric Administration. Redden declared the restoration plan from the Obama administration was too narrowly focused on habitat mitigation, and the ideas were so much mush. He allowed the current plan to stay in place until the end of 2013, when a revised biological opinion is due. The judge also pushed back against plans from Presidents Bill Clinton and George Bush. Operation of the Columbia River hydroelectric system has always been a focus. In 2006, Redden ordered water be spilled over the dams to help migrating salmon. Redden was not born in the Pacific Northwest, but he is an Oregonian to his core. 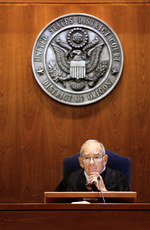 He began his legal career in Medford, was elected to the Oregon Legislature and served as state treasurer and attorney general before he was nominated to be a federal judge by President Jimmy Carter. Respect for the law and what it was intended to protect was evident in his pursuit of legal, results-oriented outcomes.